Public speakers can motivate, educate, challenge and entertain audiences. The best public speakers can do all four at the same time. A good public speaker is flexible and enjoys the diversity that each audience presents. It is an honor to speak with an audience and the best public speakers never forget that. Always strive for excellence when you are speaking in public. In no particular order, here are 10 behaviors that public speakers should incorporate into their professional conduct. A great public speaker. . .
1. . . .meets the audience. When I speak at an event with other presenters on the schedule, I am always amazed that the speakers congregate backstage and away from the audience. While some prep time is always needed before an event, make it a point to go out and casually mingle with the audience, doing more listening than talking. You will meet some great people and more of the audience will feel like they already know you when it is your turn to speak on stage. 2. . . .knows their subject matter. Speak about what you know and subjects that capture your energy and focus. You should know your subject well enough that you could spontaneously speak without notes in any situation. Be devoted to the subjects you speak about. 3. . . .uses sound equipment. While it may seem more casual to ditch the microphone, I am seeing and hearing many speakers in my coaching work that insist they do not need a microphone. Making your audience strain to hear your words is not respectful. Any group gathering that cannot fit around a conference table will require a microphone. 4. . . .dresses comfortably for the audience. Keep your clothing choices just a step above the casual or formal dress of the group. For example, if you are expecting an audience filled with blue-jeans casual, you might choose a business-casual attire. 5. . .listens to other speakers. Just as you want to meet an audience before events, it is important that speakers participate in those events. In particular, make it a point to hear the speakers that are before you on the schedule so that you will be able to make good tie-ins with the group's experience. 6. . . .incorporates learning styles. Not everyone in your audience can learn from a singular presentation style. Mix your presentation with audience activities, slides, stories and your direct input. 7. . .uses good speaking mechanics. Are you using first-rate nonverbal techniques? Vary your pacing, tone, eye contact, gestures and movement as your presentation progresses. Be interesting to watch. It was popular advice a few years ago that you should be a speaker who developed a single presentation and presented that to every audience. In addition to being arrogant, it is rude to your audience and is a way to guarantee you will not be rehired. Tweak your presentations for each audience. 9. . .uses appropriate humor. While the days of the "start with a joke" are well behind us, it is still good to use your own natural humor- staying away from traditionally sensitive topics such as religion or politics. Rather than try to be funny, simply share things that are funny to you and let the audience decide what they will laugh at. 10. . .shares good stories. Good stories, used to illustrate your points, can help an audience remember your presentation. Be on the lookout for good stories from your own life and literature that can be used for future presentations. Learn good storytelling techniques to adjust each story for your audience. In my "Storytelling 101" Eworkbook, you can learn how to develop and present stories in a step-by-step manner. You can learn more at http://www.storytelling101.com. Use this list as a place to start, but I encourage you to develop your own list of habits that will make you an excellent speaker. Sean Buvala is a "hard-core how-to-do-storytelling coach" working and teaching internationally since 1986. He has served a variety of clients with big names down to the smallest one-person business. An award-winning storyteller, he's able to help you develop and fine-tune your business speech. To set up your coaching session with Sean, fill out his contact form on his website at http://www.seantells.com. Slightly tongue in cheek, but not much. . . In a rare moment of casual TV watching, I stumbled upon one of these ubiquitous cooking challenge shows. The contestants were making cakes and trying to prove them to a line of random judges. As the judges came to one table, the cook chef, said something like, "I have here for you today a chocolate cake that has three kinds of chocolate bits in both the cake and the icing. Enjoy." The judges tasted. The judges pondered something highbrow to say. And then, further proof-that-storytelling-is-now-a-fad fell from the judge's lips, "This is delicious and the chocolate pieces really tell a story." Without further comment other than everyone nodding their heads, the judges walked away. It is a good thing that the TV universal remote controls are just $5 at Walmart. I keep breaking them throwing them at my television as I hear awful uses of the word "storytelling." I have no doubt that the producers of the TV program were in over-the-top joy over as someone placed into the show's dialogue the latest business catchphrase, "storytelling." Chocolate bits cannot speak. Chocolate bits could represent something in a story, but the bits themselves are not storytelling. Only people, using words, do storytelling. 2. Storytelling is a spoken art form and business communication tool that needs the audience and the storyteller together, live and in person. Chocolate bits do not speak. If the chef had said, "These rare chocolate bits in the cake are the last remains of hand-made chocolate my immigrant grandfather brought over from Germany. My family insisted that you, worshipful judges, be the last ones to savor them," we might have had the anecdotal start of a story. If I had heard something like this on the cooking show, then I could somehow forgive the judge for his error in the misuse of "storytelling." Taste alone is not the beginning, middle and end of a narrative. I do understand that flavors can remind the taster of a story. However, that is not what the judge said. He grabbed the word-of-the day and stated that these three flavors "really told a story." A singular moment cannot be a story. The moment needs to be placed within the story arc in order to be called story. "My mother used to make a cake with three kinds of chocolate in it and…" That would be the start of a story. 4. Not every idea is (yet) a story. Sadly, we no longer pay attention to our words. Every breath, uttered word, idea and fleeting thought is now called "story." There is only one answer to this: the power presence of "story" and "storytelling" has been completely diluted in the modern world. Flavors, utterances, insights, conversations are now all labeled "story" or worse "storytelling." So, how do we fix these issues? 1. Develop some discipline in how you approach language. Say what you mean. Know that words have meaning. Walking is not Running even if both are ways to move. Eating is not Storytelling even if both, are, well they aren't the same thing. Definition and understanding empowers us to do great things with them. 2. Stop cheating with the story tool. Storytelling cannot be done on film alone. It cannot be done by paint itself. It cannot be done alone by chocolate. It can only be done with people. If a client says to me, "We want storytelling in our company but can't commit any training time to it," I will tell them then that they can't have storytelling in their business. They will need another way to communicate their story, even if it is not as buzz-worthy as "storytelling." Recapping: People are for storytelling and chocolate is for eating. 3. Spend the time to learn how to tell a story. In the least, learn how to make a true story from your great ideas. I know, your communications consultant may have told you that storytelling is easy and cost-free. You have been misled. Maybe you are assured that everyone in your organization is a storyteller. They are not, no more than every cook is a chef. I do have some hope for you: it is easier to become a good storyteller than it is to become a good chef. Both becomings take work and focus. There may have been a great story to go with this chocolate-bitsy cake. To find the storytelling within, I would have to peer over the top of the cake, crumbs trailing on my lips, look into the eyes of the chef and say, "So, how did you become expert enough to make this cake I'm eating? How did you come across these fine chocolate bits?" In that response, I would probably find the real story behind the chocolate. I might even find a storyteller within the chef. That (you knew this pun was coming) would be the real icing on the cake. P.S. 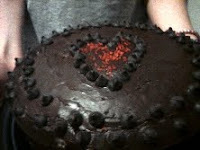 The cake in the picture was one my 12-year-old made for the 24th wedding anniversary for my wife and I. It had one type of chocolate. It was delicious. Sean Buvala has been storytelling for 25 years and is the author of the book, "Measures of Story: How to Create a Story from Floats and Anecdotes." Get your copy at Amazon.com or come by http://www.howtocreateastory.com to learn more.